Before last year fades completely in the rear view mirror, I want to share a presentation I gave recently. Jorge Soto from Sales4Startups asked me to speak at one of their awesome Silicon Valley events. Although this talk was something of a departure from my normal sales/startups topics, the audience seemed to appreciate a little weirdness at the end of the day. I’ve been in sales for my whole career, both as a sales person and a sales manager. At my own companies, other people’s companies, and at a big publicly traded company. Although that didn’t last too long. On the plane ride out, I had a chance to think about what I’ve been working on recently, and what I’ve learned. I’d like to share with you 10 specific things here. I think they have direct applicability to sales and startups, although not in a “10 tips and tricks” blog post kind of way. We are stuck in a relative world. Our perceptions of reality are all completely colored by our past experience, by our current situation, by our surroundings, by everything. And our perceptions of reality change all the time! Depending on how we feel, what we’ve eaten, how much we’ve slept, etc. The image to the right is an example. 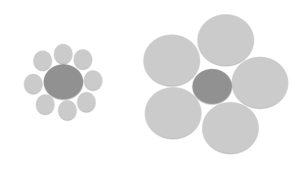 Which dark grey circle is bigger? The Buddhists say that the present moment has come together because of “Uncountable causes and conditions” The main conditions that cause the right grey circle to be smaller are the big circles around it. But there are lots of other causes and conditions that contribute. Stranger still, physicists have determined by a very complicated process of elimination, that approximately 5/6th of the matter in the universe, and 3/4th of the energy in the universe, is completely and 100% outside the realm of our perception. It’s got to be there in order for the universe to work the way it observably does. But we can’t perceive it! How can we know what’s going on if we can’t even perceive the vast majority of matter and energy in the universe???! Sure, after 20,000 years of dedicated study by the most intelligent species on the planet, we have a decent understanding of limited systems. Geology. Mathematics. Medicine. Starting companies. But if you question any expert in any of these fields, they can quickly come up with all kinds of things they don’t know about… unanswered questions. Even for simple things like – How to sell things well, how to build a small company, how to manage a baseball team… no one can give you the recipe. How to bake bread? Yes. But things involving other people, any period of time longer than a day, anything complicated AT ALL… and we have no firm answer. The systems are just too complex. With the present moment so incredibly rich, complex and mysterious, how can anyone know what’s going to happen in the future? So the situation sounds pretty bad. No one knows what’s really going on, and no one knows what’s going to happen. The good news, is that we’re all in it together. Even your co-founders. Even your investors. Even the biggest baddest “Master of the Universe” VC has no real idea what’s going on or what’s going to happen. Narrow the problem. Focus on what you can affect. Try to figure out your motivations and what makes you happy. That’s what the rest of this post is about. But don’t forget about the water in which we swim, because it’s the thing that unites us all. Anyone know what this image is? Any economists out there? 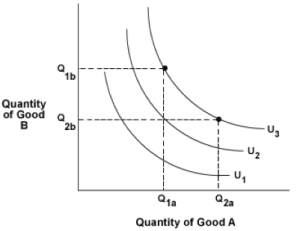 It’s a set of curves describing two parties becoming better off by trading “Good A” and “Good B”. It’s called a utility curve. Sales (in this case trade) is about creating value for both parties. So at its root, Capitalism is about creating happiness. The problems with capitalism are all about the options available to people, the environment that people work in, and how the created value gets distributed afterwards. That’s beyond the scope of this post, but if anyone wants to discuss over a beer, please let me know. Most of our waking life is spent at work. Spend that time with people who help you be a better person. Smarter, more thoughtful people – people endowed with interestingly different perspectives on life. If you don’t see those qualities in the people around you, first start by asking yourself if you really know those people. Have you given yourself a chance to understand their amazingness? When you get sick of that, look for a new job. Or create one yourself. But only work with great people. This is not for everyone. My first company was a small idea, and we sold it before it could get very big, because we weren’t up to growing a big company. But if you are up for it, working on something demonstrably, clearly, almost inarguably big, is much more fun than working on something small. For our first two years at Yesware, I struggled to frame the market for Yesware in a compelling way. I would point to the size of the CRM market, or the estimated number of salespeople in the world. Then I reframed our market story this way: Companies paid out about $650 billion in sales commissions last year. Those payments comprise a zero-sum game. If you and I are competing for a deal, and you win, you get the commission. I don’t. In a broad sense, every salesperson in the world is fighting for their share of that $650 billion pie. Yesware helps our customers get more than their fair share. This story wasn’t about a Gartner number (in fact, I estimated the $650 billion number myself from a number of government sources). This story was about the world of a salesperson – how big and how competitive it really is. I’m sure that reframing the Yesware opportunity helped us close our Series B financing. Without a Very Big Story, Battery Ventures is not going to lead your round. In our daily life, at work and outside work, there are so many priorities, activities, emails to check. How many inboxes of various kinds does everyone have? I recently counted 20 places where people I have some relationship with can leave me a message. I’m supposed to check them all? You probably have more. But it’s a lot harder to do nothing than to do something. Have you ever tried doing nothing? I don’t mean accomplishing nothing by watching the World Series (GO SOX!) or reading a blog. I mean actually do nothing. Be bored. Don’t feed your mind for just a bit. 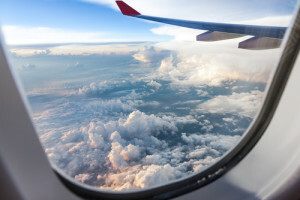 Here’s a fun thing to try… next time you are on a plane, unplug your earbuds and look out the window as the plane takes off. Just pay attention to the sound and the view and the feeling in your body. WHY IS THAT SO HARD TO DO?!? We need to have space in our experience to let insights arise. If we are always doing something, nothing simple and pure and beautiful can come up. Everyone harbors some fear that they will get found out as a fraud and will lose everything they’ve worked so hard for. In late October, I went to a “CEO Bootcamp”. This was a gathering of 14 CEOs from small companies. Some were venture backed, some bootstrapped. Some were from the US, some abroad. 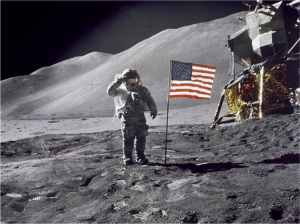 All of us were spending serious time and money to explore what was holding us back, and what we could build on. The Bootcamp was expertly led by Jerry Colonna and an amazing group of teachers. It was held in gorgeous central Colorado at the Devil’s Thumb Ranch. But the real attraction for me was the other CEOs. Who were these people? What could I learn from them? What would they think about me? Would I have anything to contribute to such an impressive group? After a welcome dinner, we all sat in a circle and read out the list of things we wanted to ask the rest of the group. One theme rose clearly out of everyone’s questions – the feeling of being an imposter. At some time in the last month or so, most of us had felt like a complete and utter fraud. We had all been afraid that someone else, especially someone else in authority, was going to figure out that we were a total sham. They would expose us. We would be stripped of all our accomplishments. Everything that we had worked so hard for would be taken from us and we would have to start all over. The masquerade would be over and we would be revealed. Whoa. These people? Felt That? I knew I certainly did, but I really didn’t think people like this did. The commonality of our shared emotional chaos washed over the group. Over the course of the weekend, we talked about the “Imposter Syndrome” and different ways it manifested in our professional lives. Having these conversations didn’t banish the feeling, but knowing other people experience it has made it a lot less painful. If you ever experience the Imposter Syndrome, the only antidote I’ve found is to get peer support and talk about it. You definitely aren’t suffering alone. Another way to say this is “Be Transparent.” But this is a little more difficult. It’s easy to be honest when the answer makes you look good. “Push against the honesty barrier” means when you are feeling the reluctance to be honest, push against that and really be honest. At charities they say “Give until it hurts a little.” When you are working out they say “Go for the burn.” Same thing here. This is especially hard in sales when there’s a big short term gain right in front of you. But I’m sure it’s the right thing for me to do. One big thing I need to learn – how to scale a company from 40 to 400. What are things you need to learn to get where you want to be? That’s probably worth contemplating before we get too far into 2014. I’d love to hear your comments on this post below, on Twitter (@mbellows) or via email at matthew@yesware.com. Thanks for reading and here’s to a great 2014!